Plant produces good yields of 3 �" long by 1 �" wide hot peppers. 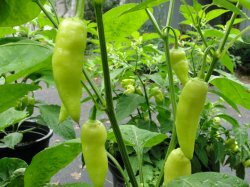 Peppers are hot and turn from light green, to pale yellow, to red when mature. Plant has green stems, green leaves, and white flowers. Excellent for making salsa. A variety from Curico, Chile.